FAQ's - Canada Super Centre – Your pre-owned supercentre! Q: Is Winnipeg Pre-owned Super Centre for new cars or used cars? A: We have an expansive inventory of both new and used cars, trucks. Our financing experts will help you determine the best situation for you. A: Interest rates are influenced by several factors, including the severity of credit problems, the down payment amount you can place, and the degree of credit risk. Your auto loan expert will explain these factors, and tell you exactly what your interest rate will be. A: You will be contacted promptly by one of our application approval representatives. The approval process is usually within several minutes to a few hours, depending on how much credit information you can provide. Q: Can I get a loan even if I have bad credit? A: Of course! Whether you have bad credit, no credit, bankruptcy, repo, divorce, or you are new to the country – our lenders will work with you every step of the way to help you get approved! A: A co-signer is an excellent way to help you with your approval process. If your co-signer has good credit status, this will definitely help your chances of getting an approval. Q: Are there any fees associated with your Approval Application? A: This is a completely free service. 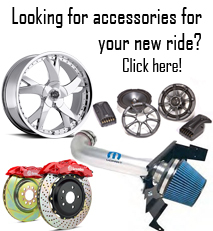 In fact we have monthly giveaways for car audio and video upgrades, vacation packages, and home electronics. Check out our homepage to see what we are giving away this month.